Obituary – Ley, Francis DePaul Gustavus « Perry High School Alumni Association, Inc.
Frank G. Ley, 88, of Perry, Oklahoma was the son of Gustave Adolphus and Katherine Ann (Ward) Ley. 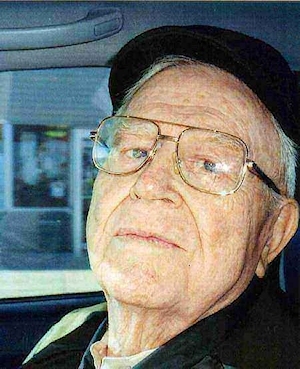 He was born July 19, 1916 in Perry, Oklahoma and died Sunday, August 1, 2004 at Green Valley Nursing Home in Perry. He was a 1934 graduate of Perry High School and received his accounting degree from Oklahoma A&M in 1938. In the 1930s, he was a catcher for the Perry Sandlot Team. While at Oklahoma A&M, Frank was a member of the schools baseball team and played the cornet in the band. He and the former Alberta Cress were married on June 12, 1940 in Perry, Oklahoma. Frank served in the United States Navy from November 10, 1942 until February 17, 1946 and earned the rank of Lieutenant before he was honorably discharged. He was a Certified Public Accountant and was involved in the insurance business in Perry, where he co-owned and operated Ley-Andersen Insurance with his long-time partner, Howard Andersen. Frank was a life-long sports fan and was a member of St. Rose of Lima Catholic Church, the Knights of Columbus, the Perry Elks Lodge and the Perry Lions Club. A rosary service will be at 7:00 p.m. Wednesday, August 4, 2004 at St. Rose of Lima Catholic Church. Funeral services will be at 11:00 a.m. Thursday, August 5, 2004 at St. Rose of Lima Catholic Church in Perry. Father Tom Dowdell will officiate. Interment will be in St. Rose of Lima Catholic Cemetery under direction of Brown-Dugger Funeral Home. Memorials may be made to the charity of the donors choice. Survivors are two sons, Dr. Paul F. Ley and his wife, Donna, of Ponca City, Oklahoma and David C. Ley and his wife, Barbara, of Oklahoma City, Oklahoma; one daughter, Alda Perry and her husband, Bob, of Somis, California; seven grandchildren, Christy Haskell, of Camarillo, California, Rob Perry, of Oklahoma City, Oklahoma, Laura Perry, of Somis, California, Natalie Goldman, of Ponca City, Oklahoma, Nicholas Ley, of Ponca City, Oklahoma, Tyler Ley, of Austin, Texas, and James Ley, of Oklahoma City, Oklahoma; five great-grandchildren, Rhemi Goldman, Gauge Goldman and Hunter Goldman, all of Ponca City, Oklahoma, and Ethan Ley and Isabel Ley, both of Austin, Texas.